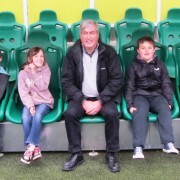 County MSP Iain Gray met a group of pupils from Prestonpans Primary School at Easter Road on Saturday as they marked their completion of the Hibernian Community Foundation’s 90 Minutes Club programme. The programme is part of the Foundation’s community engagement work and combines football coaching with encouraging pupils’ with their homework. To mark the end of the programme the pupils got to attend Hib’s last league game of the season against Kilmarnock on Saturday and participate in the half-time goal challenge on the pitch. “One of the reasons I was pleased to get involved with the Hibernian Community Foundation is that it is helping a range of people here in East Lothian, including many children, to improve their health and develop their learning through football. “The 90 Minutes Club is a great example of how football can be used to encourage children to enjoy doing homework and learning. The pupils from Prestonpans had clearly got a lot out of their participation in the club and certainly enjoyed their day out at Easter Road on Saturday. The Hibernian Community Foundation aims to harness the power and passion of football to make a real difference to people’s lives. It partners with other organisations to improve health, promote learning and enhance opportunity. In the past year the charity’s activities created more than 10,000 opportunities for engaging with people in the community. These activities range from courses to improve literacy and IT skills to projects to help fans with fitness and weight loss. 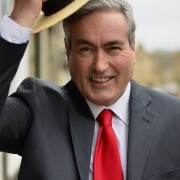 County MSP Iain Gray is supporting Hats for Headway, a national fundraising event taking place on Friday 16 May, to help mark this year’s Action on Brain Injury Week. Mr Gray has supported a Holyrood motion backing the annual awareness week and congratulating the charity Headway on the work it does at its various centres, including here in East Lothian. Action on Brain Injury Week, which runs from 12 to 18 May, aims to increase awareness of the plight of individuals and families that are affected by brain injury. For Hats for Headway day people are being invited to raise funds for the charity by wearing a hat for the day in return for donations. Last month, Mr Gray visited Headway East Lothian to help that charity to mark a decade of supporting the local community with the first publication of its Edinburgh and East Lothian Directory of Brain Injury Services. “I welcome Action on Brain Injury Week and its focus on raising awareness of how access to vital support services is being reduced as a result of funding cuts and welfare reforms. Brain injury can strike anyone at anytime. It can have a significant impact on day to day life and rehabilitation can be long and difficult. County MSP Iain Gray returned to his teaching roots today when he visited Preston Lodge High School to speak to S2 biology pupils about climate change and renewable energy. The school invited the former physics teacher to come in and talk about the work the Scottish Parliament is doing to tackle climate change and promote the development of renewable energy. The pupils had been working on the subject in class and wanted the opportunity to find out more about the actions politicians are taking on these important issues. 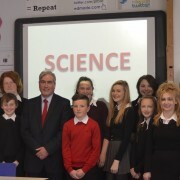 After Mr Gray had spoken to the class, they asked him a range of challenging questions on climate change and renewables, before branching out into questions on other aspects of his work as the county’s MSP. They also managed to persuade him to take his first ‘selfie’ with them, making it another first for PL! “I always find school visits to be one of the most enjoyable aspects of my work and want to thank Preston Lodge for inviting me in. As a former physics teacher, it was a particular pleasure to talk to a science class about the hugely important issues of climate change and renewable energy. “The pupils had been studying the subject and were clearly eager to learn more about the practical steps that politicians are taking to counter climate change and promote renewables as an alternative to fossil fuels. They are fascinating and vitally important matters and Scotland certainly has a positive story to tell. Politicians accusing each other of scaremongering is a feature of the political “debate” these days. Sometimes, though, the scare stories are true. A few months ago I warned that Police Scotland’s decision to get rid of our traffic wardens would cause major traffic problems in the County’s towns, and I take no pleasure in being proven correct. In Haddington, not only is it proving impossible to find a parking space, but bus journeys have been disrupted by double parking and worse. Dunbar traders’ Association have asked me to meet with them to hear their concerns they are losing out as customers give up on finding anywhere to stop, and constituents in North Berwick are seeing a difficult parking situation get steadily worse. I have raised these concerns with the Police and police officers have been enforcing parking restrictions. Issuing parking tickets is hardly the best use of uniformed police officers’ time, but there is no one else entitled to do it now. If the Council want to employ their own wardens, they will first have to pass an order through parliament and that may take months if not years. Then there is the cost. The Council already pays hundreds of thousands of pounds to the Police to secure additional police officers in the County, a measure which has been very successful in reducing crime such as anti-social behaviour. Paying wardens would be an additional cost. The removal of police traffic wardens was a bad decision, taken nationally not in East Lothian, without consultation, and one for which the government minister in charge simply refused to take any responsibility. Local motorists, local traders and local police officers are the ones paying the price. Employment figures in East Lothian are now higher than pre-recession levels, recent labour market statistics have shown. According to a paper released last week by the Scottish Government, which has collated the most up-to-date Office for National Statistics labour market data, the county is now one of only three local authorities in Scotland with a higher employment rate than in 2008. East Lothian has also seen the largest fall in economic inactivity of any authority since 2008, and is one of only a handful of areas where both public and private sector employment has gone up in the last year. Local MSP Iain Gray has welcomed the figures and paid tribute to the work that Labour-led East Lothian Council has done to develop and promote local training and employment opportunities, particularly for the county’s young people. “This is a good news story for East Lothian. The council and employers across the county should be proud of their resilience to several years of difficult economic weather. “East Lothian Council deserves particular credit for this success. The Labour-led administration came into office two years ago pledging to make the local economy and job creation its top priority and it has more than lived up to that commitment. “Initiatives such as East Lothian Works and the East Lothian Tourism and Hospitality Academy are clearly helping to make a difference on jobs, especially for young people. And it now looks likely that substantial European funding will be secured by the council to give a further boost to local jobs. “But we can’t be complacent. While these figures show East Lothian is doing better than nearly every other local authority by this measure, many of my constituents are not finding this success reflected in their own circumstances and pay-packets. 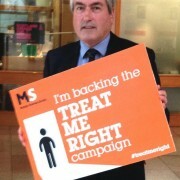 County parliamentarians Iain Gray MSP and Fiona O’Donnell MP have both given their backing to the MS Society’s Treat Me Right campaign during this year’s MS Week (28 April to 4 May). Mr Gray joined MS Society campaigners at Holyrood to support the campaign, which aims to ensure that licensed treatments for MS are freely available to everyone who needs them and that people with MS are active, informed and equal partners in their care. Meanwhile, Ms O’Donnell expressed her support by signing up to a Parliamentary Early Day Motion (EDM) at Westminster highlighting this year’s MS Week and welcoming the new campaign. “For the more than 10,000 Scots living with Multiple Sclerosis (MS), including many here in East Lothian, the right treatment can make a huge difference to their lives, from helping control relapses to managing symptoms. “MS Week is an important opportunity to raise awareness of Multiple Sclerosis and the needs of those affected by the condition. The MS Society says people often face difficulties in accessing MS specialists and a lack of information about the treatment options available to them. The Treat Me Right campaign, which was launched at the start of MS Week, is highlighting the various barriers that people living with MS currently face to accessing the care and treatment they needs. 4. Accessible information about treatment options, and support to be equal partners in decision-making about their treatment and care. 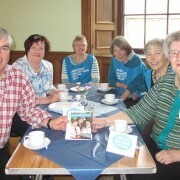 Iain Gray MSP and Fiona O’Donnell MP were pleased to attend the Parkinson’s UK East Lothian Support Group’s annual coffee morning at Haddington Town House last Saturday morning. The group’s coffee morning has become a regular fixture in the county’s calendar of charity fundraising events, and was well supported again this year. County parliamentarians Iain Gray MSP and Fiona O’Donnell MP are backing the Royal Voluntary Service’s Great Brew Break Week, which is taking place between 28 April and 4 May. A recent RVS poll showed that the traditional British tea break is under threat like never before. As a nation built on the tradition of a cup of tea and its enduring social warmth, 40,000 Royal Voluntary Service volunteers serve thousands of cups of tea every week to those in need. The Great Brew Break is a chance to gather friends, family, neighbours and colleagues and raise funds to support lonely older people. People across the UK will be holding tea events during the week, with all the proceeds going to help the charity deliver services to alleviate loneliness among older people. Mr Gray and Ms O’Donnell are encouraging county residents to support the week either by attending the Mad Hatter Tea Tasting fundraiser at the RVS Haddington Centre at the Sidegate on 30th April, between 10am and 3pm, or by taking their own tea break sometime during Great Brew Break Week. To host your own Great Brew Break visit www.royalvoluntaryservice.org.uk/brewbreak for everything you’ll need to get for the perfect Brew Break. The RVS in East Lothian can be contacted on 01875 811 011. Fuel poverty in Scotland has increased dramatically in the past few years. Over 900,000 households in Scotland are suffering from fuel poverty. This is a national scandal. Here in East Lothian there are at least 11,000 households in fuel poverty. We know with the recent inflation busting increases of the energy companies that the number is even higher. Despite all the rhetoric from the SNP, the number of households in fuel poverty has actually gone up since 2007. The Scottish Government has failed to spend the money it has to combat this growing scourge. Iain Gray MSP has called for the SNP to turn their words into action, following a Scottish Labour-led debate in the Scottish Parliament on the 23rd of April to discuss the growing crisis. “Fuel poverty is a national scandal which is affecting more Scots every year. Here in East Lothian, around a quarter of all households are suffering fuel poverty. While this is slightly below the Scottish average, it is still far too high and means that many thousands of local people struggle to afford to heat their homes. “The SNP talk a lot about how things might be better after independence, but households need help now. There is some support available currently, and anyone in East Lothian who is struggling to pay their energy bills or wants advice should seek help from agencies such as their local CAB, Energy Action Scotland and Carers of East Lothian. “However, it’s really important for the Scottish Government to do more. I find it outrageous that the SNP have failed to spend the money they have on helping to insulate homes and helping to reduce fuel bills. What is even worse is that the SNP are refusing to back our calls for an energy price freeze. “Alex Salmond has met with the ‘Big 6’ energy companies eight times since 2010. Not once has he ever asked them to freeze their prices. Not once has the SNP’s Energy Minister asked them to cut their bills. “So rather than speaking up for our poorest, Alex Salmond would instead back the big energy companies. As thousands more Scots slip into fuel poverty because of his government’s incompetence, Alex Salmond takes the side of big business. Any East Lothian residents who are struggling to heat their home should seek help and advice from Energy Action Scotland www.eas.org.uk, Carers of East Lothian www.coel.org.uk, Citizens Advice Scotland www.cas.org.uk or by phoning the Home Heat Helpline on 0800 33 66 99. 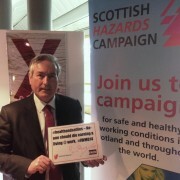 Iain Gray, MSP for East Lothian, met representatives campaigning in the Scottish Parliament this week for better safety standards for workers. Scottish Hazards and Families Against Corporate Killers (FACK) hosted an exhibition in the parliament to highlight their campaigns ahead of International Workers’ Memorial Day on 28 April. Statistics produced by the Health and Safety Executive reveal that 22 workers were killed in work-related incidents in Scotland last year – an increase from the previous year. Many hundreds more each year die due to work-related illnesses. “Through regular visits I know that our big local employers like Torness and Lafarge Tarmac take the safety of their workforce very seriously nowadays. But I also know that workers and their Trade Unions had to fight hard to achieve that, and it is also true that too many of my constituents still die before their time as a consequence of hazards like asbestos encountered in their jobs not so long ago. “We can never let attention to safety at work slip because it is completely unacceptable in the 21st century that anyone should go to work and not come home due to a fatal accident. “This is why we have regulations – to protect people from unnecessary risk or harm. These are belittled when considered only as ‘red tape’ in need of cutting.